On the first Saturday of every month, at different public places, HIJOS México and ¡Eureka! Install an exhibition of the disappeared, the victims of political repression. On Saturday, February 1st, they installed photographs of the disappeared around a fountain in Parque de los Venados, where they informed the festive and sportive citizens gathered there of the purpose of their organization. “Hijos por la identidad y la justicia contra el olvido y el silencio” (“Sons and Daughters for Identity and Justice Against Oblivion and Silence”) is part of a network born and grown in Argentina, from the Madres de la Plaza de Mayo movement, now diversified in children, grandchildren and grandmothers, after having resolved differences and tactics through investigated cases that have had a positive result, as well as the finding of children who were kidnapped at birth to be sold to military couples after the murder of their mothers. With a supportive government involved in the task of constantly constructing historical memory, a government that has put on trial and jailed the murderous military officers involved in coup d’états, actions are facilitated and give rise to monuments and museums at the sites where multiple acts of repression took place. The brave constancy of the white-scarfed women, installed week after week in the square facing the government house in Buenos Aires, has overcome the denigration generated by the dictatorship, which called them crazy, “a few crazy women”, with that indictment of a minority which is so typical of dictatorships. In solidarity with ¡Eureka!, they have contributed to the permanence of the Mexican organization of relatives of the prisoners, the prosecuted and the disappeared at the hands of the government since the 1970’s; not because there are no earlier victims of repression, but because they aim at tending to the thousands of denunciations deriving from the “dirty war” from the 1970’s up to this day. In Mexico there are no favorable conditions for this struggle, faced with the State’s human rights commissions, limited to the right to recommend minor actions, not always fulfilled by the invincible criminals, sheltered by their official posts. 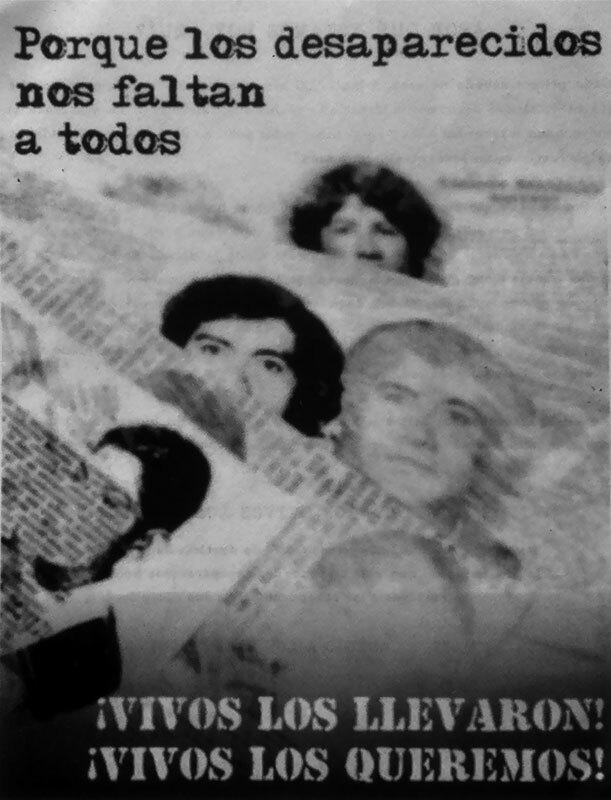 With the slogan “They took them alive, we want them back alive!”, HIJOS installs the photographs, the names and descriptions of some of the disappeared. This activist group alternates non-commercial music with information about their purposes, while they hand out flyers and a postcard showing actor Rodrigo Murray holding to his chest a photograph of Jesús Alvarado Prieto, a professor disappeared in 1980. “We all miss the disappeared”, reads the postcard. On Thursday, February 6, we talked about these matters with a representative of the Darío Santillán Front, named after the protester gunned down at the Avellaneda train station, and signified by a photograph showing Maxi’s dead body, and Darío kneeling beside him, signaling with his arms to stop the bullets that would also kill him. In the stairs, there is a small portrait of Darío, and there is a wall with a small altar. The names of Darío and Maxi are respected by the Argentinian federal government, in spite of the reactionary character of the municipal government. In Mexico, the government is hostile. For instance, Rosario Ibarra’s Museum of Indomitable Memory remains closed, due to administrative negligence. Projects and models for the expropriation of the former public space, to benefit private tourism developers, replace the construction of historical memory in the Mexican capital. This is why the scattered efforts of civil organizations, such as HIJOS México and ¡Eureka!, must be supported. During her illustrated lecture at CENIDIAP, in the National Center for the Arts, the comrade from the Darío Santillán Front explained why they adopted Darío’s name, the protester who appears in the emblematic photograph with his hand raised as a sign to stop the repression, and with Maxi Kosteki’s body lying on the ground. They chose it because his raised hand is emblematic of solidarity and of the urgency to put a stop to military brutality. Besides demanding that the inspector Alfredo Fanchiotti and corporal Alejandro Gabriel Acosta, directly responsible for the murder, be sentenced, these groups incorporate this crime to the cultivation of the memory for truth and justice. Thanks to a just government, the murderers have been sentenced to life in prison, and three other policemen are serving 4-year sentences for aggravated cover-up. Dignidad Piquetera is a book published by the Darío Santillán Popular Front that explains all this. A beautiful book, in full color, with excellent illustrations from the Guagüita collection of Editorial El Colectivo, with a text by Silvia Paglieta and Darío’s handwritten name, narrates the life and struggle of the piqueteros, adding excellent end notes regarding places, dates and names. Postcards with eloquent images and precise explanations on the back, show, for instance, the Darío and Maxi Station project, by Taller Libre de Proyecto Social, with the annotation: es-cultura popular (popular sculpture/s-culture). The land for it has been granted, but only if they abstain from changing the names of Avellaneda or Roca, “responsible for the slaughter of gauchos and Indians when they were Presidents of the Republic”. Adding to the exaltation of their exemplary lives, there is veneration at the altar and a ritual on June 26, promoted by the mystic Mabel Godoy, who distributes a handwritten flyer about “Saint Darío of the Train Platform”. Murals, stencils, a large, burnt banner showing the face of former president Duhalde in 2009, fulfill the 2012 slogan: “Ten Years After, His Example Multiplies”. Let this description suffice to imagine the articulation of similar actions to advance historical memory. This is exemplary, because of its constancy and discipline, which enable us to speak of a genuine movement and mobilizations that incorporate thousands of activists in the task of constructing an emancipatory social subject. The visit made by the lecturer to the Popular Culture School “Mártires del 68” consumed many hours, exchanging experiences and projects. The struggle continues on.